Fridays Puerto Galera takes you to all of the top diving spots in and around Boquete Island, including dive sites that aren’t offered anywhere else. Our dive shop is just five to fifteen minutes away from over 30 scuba diving spots in Puerto Galera. These include dramatic walls, historic wrecks, and diverse reefs around Sabang and Verde Island. 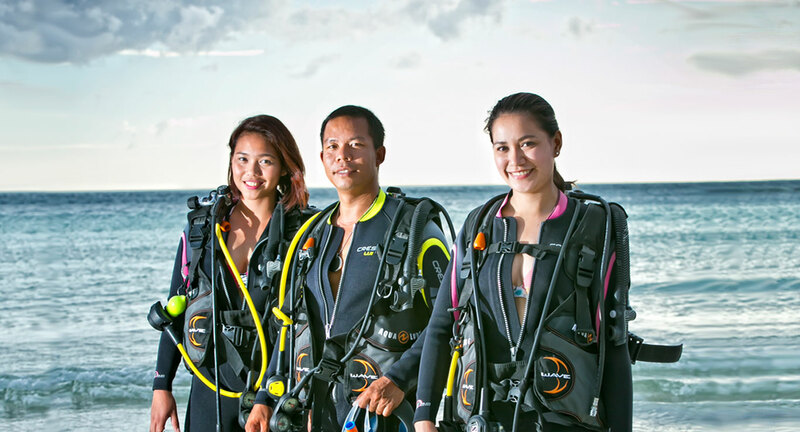 This is a 3-hour course that covers a short briefing of basic scuba skills, a practical test in a waist-deep pool, and an open-sea dive with the guidance of our dive master. It takes 3 to 4 days to be a certified scuba diver. Once you have finished your certification, your license will let you dive anywhere in the world. The course is divided into 3 parts: theory, skill practice in confined water, and practical application in the sea. You’ll get to experience four open-water dives by the end of the course. This course covers five different adventure dives. It includes a 30-meter dive and a night dive. Level up your diving skills by learning to rescue yourself and your buddy. This certification is a prerequisite for all dive professional level training. The PADI Dive Master course is your first level of professional training. Working closely with a PADI Instructor, you’ll fine-tune your dive skills and refine your rescue skills. This special course is for first aid training and basic life support. This is a refresher course that is mandatory for divers who haven’t dove for more than 2 years and for newly certified divers who haven’t dove for a year. Verde Island and the surrounding waters is known as a “center of marine biodiversity”. There are more species of fish here than anywhere else in the world. Just an hour boat trip from Puerto Galera, you’ll have amazing visibility and a rich abundance of marine life. This is an excellent site for beginners. Some of the clams here are over 60 years old. Despite the shallow depth, there are lots to see including patches of marvelous corals that grow from the ocean floor. Keep a sharp eye out for reef octopuses that change color in the blink of an eye. Three small boats have been purposely sunk to create artificial reefs. Big schools of batfish and surgeonfish can be seen here. Camouflaged on the wrecks are scorpion fish. Stonefish and lionfish are also a common sight. With a maximum depth of 70 feet, divers can cover all three wrecks in one dive. This site is good for beginners and the slightly more advanced divers. With numerous species of tropical fish swimming around healthy corals and critters hiding beneath the rocks and sand, it is a sight to behold. When the tide is favorable, divers can drift down the channel at a leisurely pace. This is one of the best dive sites in Puerto Galera. There are three canyons running side-by-side where fish go to hide from the currents. Expect to see varieties of sweetlips, trevally, batfish, groupers, snappers and more. Swim down through a hole in the wall that the water has carved out after millions of years of erosion. This truly surreal experience is made even better by the strong currents that have attracted varieties of big fish. This area is perfect for mild to strong drift dives. If you catch the current at the right time, it can take you along this sloping reef effortlessly. Massive schools of red tooth triggerfish meet you at 15-meter depth and in very shallow water, countless numbers of chromies swim around making you a part of the school. Moray eels can be seen all over this reef. Blue spotted rays can be seen on the sandy bottom. Just East of Ernie’s Cave you will find Dungon Wall. It starts off with sloping bottom that leads up into a wall. Here, you will see many lionfish, eels, scorpion fish, nudibranchs and other reef species. If you’re lucky, you’ll also spot a pygmy sea horse. This site is a gentle slope with many different kinds of corals. There is also a small sailboat wreck in the area. You can get a maximum of 27 meters around the deeper Ernie’s Cave where there used to be a big grouper named Ernie. Scribbled snapper, titan trigger fish, blue fin trevally, long nose emperor, turtles, blue spotted rays, and many more can be seen here. This is also a fine place to drift along with a mild current which let’s you cover a big part of the reef on a single dive. This site will make macro photographers swoon. You’ll see angler fish, colorful nudibranchs, majestic wonderpuss, and all sorts of critters. With beautiful pink corals carpeting the bottom of the ocean floor, you’ll have plenty of subjects to shoot.